The technology is based on vapor filtration, where the impure water is first heated and made to vaporize, then water vapors are filtered through a thin sheet of porous hydrophobic membrane. The water vapors are collected on the other side of the membrane and cool down using external cooling water loop. Due to the two consecutive stages in the one unit, the product water has higher quality than obtained from any other related technologies. 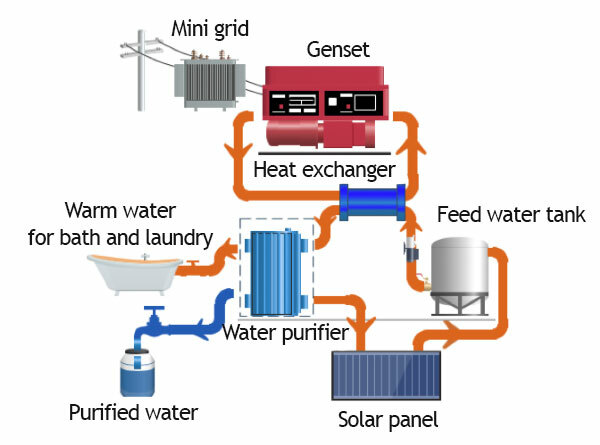 In addition to the pure drinking water, a WaterApp unit connected to a Genset as shown above can be used to supply warm water for showering, laundry and so on in a house.